On of a Kind! 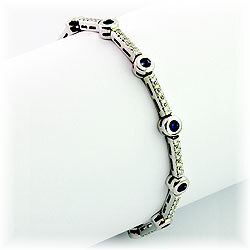 18K solid white Gold bracelet. 1.1 carat full cut Diamonds. northern Tanzania in 1967, near the city of Arusha. The stone presents fantastic deep blue colors! A one of a kind offer of a true hand craftsmanship.